It’s Spinal Awareness Week so we’re focussing on why a healthy spine means good health and vitality, and how the key is balance in all things. The theme for this year’s Spinal Awareness Week is stress. How all kinds of stress – emotional, physical and environmental – affect our spinal health as well as our overall health and wellbeing. Taking good care of your spine with regular chiropractic adjustments is certainly one way of supporting your body to deal with stress but there are other things you can do to help as well. 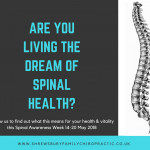 Are you living the DREAM of good spinal health? Balance in all these five areas leads to good spinal health and vitality – too much will add to the stress, as will too little. Like Goldilocks, we should be constantly aiming for, ‘Just right’! Diet: Why is eating a balanced diet so important for spinal (and general) health? Whatever we put into our bodies today forms the building blocks of our bodies tomorrow. Your body is constantly healing and regenerating, but it needs good quality ingredients to do this well. If the spine is not supplied with enough good quality nutrients, it won’t be able to heal and adapt to life stressors positively. What happens to your spine when you eat too much bad or poor quality food? Weight gain or being overweight is one of the leading factors in poor spinal health. Extra weight places unequal stress through the spine, so some areas have to work harder to keep you upright. The body can cope with a little extra stress short-term but over time, spinal posture will change leading to an increased risk of degeneration in the spine. Maintaining a good, healthy diet can help you live a life that is less stressful for your spine. How does eating too little food impact our spines? Everybody knows that energy in equals energy out. If we don’t take in enough energy for the body to function well, it goes into ‘panic’ mode. What happens next is that when we do eat something, instead of that energy being used to help the body and spine heal and regenerate, it’s stored away (as fat) for a rainy day – another time when you aren’t eating enough. But eating enough of the right kinds of foods can help your body make use of it where and when it’s needed – and that will help maintain a healthy spine. I hope you had a great night’s sleep, because that will have an impact on your spinal health. Enough rest is key to your spinal health – everything from the number of hours sleep you get per night, the timing of our sleep (whether at night or during the day) and how much ‘rest’ we get sitting down relaxing. The average person needs 8 hours of sleep each night and, if you’re awake at night but sleep during the day, your body will find it very difficult to cope! It’s all about finding the right balance. Sleep is the time when the body restores and regenerates the most, so good quality sleep is the key to a healthy spine and body. If you get fewer than 7 hours sleep per night your body really starts to struggle. Research published in 2012 shows an association between too much or too little sleep and the development of chronic diseases. This shows how important the right amount of sleep is on our health. After a long day at work, what’s the first thing you want to do? It’s probably to flop onto the sofa. But what does that do to your spine? A lack of good movement as a result of too much sitting can stiffen the spine. This stiffness will reduce the movement in your spine and can, potentially, result in subluxations (ask your Chiropractor if you are unsure what a subluxation is). Subluxations can have direct negative effects on the health of your spine. How much exercise do you think is enough? A walk twice a week? A bicycle ride once a week? The body and spine require a certain amount of movement and exercise to thrive. Current guidelines are 150 minutes of moderate aerobic activity (that gets your heart pumping faster) plus strengthening exercises 2 or more days a week. Exercise has been shown to improve digestion, help restful sleep, weight loss and much more. But healthy movement also helps bring nutrients to (and remove waste from) the spine. If there is a lack of movement, this process becomes stagnant. So for a healthy spine, it’s important to include more exercise in your weekly routine. Whether or not we do it, we all know that exercise is ‘a good thing’, right? But it is possible to do too much. If we exercise too much too soon, our body can panic. It starts to think that it’s under attack and goes into protection mode. The spine houses and protects the spinal cord – literally the nerve centre of our entire body – so this protection mode can tighten the muscles around the spine ensuring that, if it can’t move, it can’t break or be damaged. A controlled and steady increase in exercise (check with your doctor first) is the best way to help your spine. This is exactly how our bodies respond to stress from life – if you don’t use it, you will lose it. If we don’t exercise enough, our muscles will weaken and become smaller, our bones can also become weaker. In later life, this is really key to good health and independence. If our muscles are weaker, we are more likely to fall over. If our bones are also weaker (osteoporosis), there’s a higher risk of fractures. Having good strong bones in your spine and strong muscles controlling its movement is the key to having a healthy spine and ageing well. Adjustments: When was the last time you saw your Chiropractor? I don’t mean as you were walking through town! When was the last time you saw them in their office? Spinal health is directly linked to being regularly adjusted. We know that adjustments improve the function of the spine and spinal nerves, allowing the body to function better. A spine free of subluxations is a healthy spine. But how does the adjustment help? Each adjustment into the spine directly affects the nerve flow and communication to the brain. If the brain knows exactly where the body is, and what’s happening there, it can accurately decide how to help, heal and regenerate. What happens if you don’t see your Chiropractor often enough? We know that when you have regular adjustments, there is a delay in the chemical changes (inside your joints) that happen in response to knocks and falls and can lead to wear and tear. After about a month of regular chiropractic adjustments we start to notice long-lasting changes in the body. This is why, once you’ve been through a specifically tailored course of care, the plan is for you to have an adjustment once a month. Makes sense, right? If we catch any stiffness that might develop in the spinal joints within the month, those chemical changes won’t have chance to start causing problems. So an adjustment at least once a month helps maintain spinal health. If you’ve followed us all week you will know that now is the time we talk about ‘too much’ But what about your chiropractic adjustments …… is there such a thing as too many adjustments? Nope! If your Chiropractor identifies a subluxation, you need an adjustment. Some people come to our office in a really bad way with loads of symptoms and, in these cases, we might suggest another check and, if needed, another adjustment in the very short-term. When was the last time you took 5 minutes for yourself? 5 minutes of reflection. No interruptions. Nothing. The last, but not least, component of living the DREAM is mindfulness. You may have heard about this recently as it seems to be the thing of the moment. But what’s it all about? Mindfulness is about checking in with your inner self. Acknowledging what’s going on, accepting it and then moving on. There are lots of ways to help with mindfulness. If are interested, ask your Chiropractor at your next appointment, or search for apps like ‘Headspace’ on your smartphone. Practicing mindfulness reduces mental stress which helps reduces tension and stress in our body, allowing the spine to function properly. We all have times when we overanalyse and overthink. Arguments, events that don’t go to plan, or those times when our internal self goes into overdrive – we’ve all been there! How do you feel when you have one of these ‘moments’? Quite often, they can leave us feeling drained. They can interfere with sleep, make us feel tense or sad. All of this directly influences our spinal health. Stressful situations cause our muscles to tighten (especially in the shoulders and neck) which can stiffen the spinal joints. Being more mindful can combat this reaction to stress and improve spinal health. What happens when we’re not mindful enough? Our blood pressure increases, our stress hormone (cortisol) increases, we struggle to sleep, we feel less motivation to get out for that run, we don’t eat as well – we unconsciously munch our way through the contents of the snack cupboard…. The list goes on. By now you should realise how this can negatively affect spinal (and general) health. So, living the DREAM of the right balance of diet, rest, exercise, adjustments and mindfulness supports spinal health (and of course, your overall health as well) and helps your body respond to all the many forms of stress in a healthier way. I hope we have inspired you to make some changes – let us know how you get on and if we can help you along the way! Happy Spinal Awareness Week. If you have any questions on anything related to spinal health, please ask us! We are here to help! !